But in the early days of the Church, Lent was not so much a time to focus inward. It was time for Catholics to focus outward. It was a time not just for personal growth, but for growth of the Church. In the days of the Church Fathers, did the whole Church fast, pray, and give alms for the forty days preceding Easter? Absolutely. But Catholics did this primarily for the sake of others. There were two groups of people that were the main beneficiaries of this prayer and penance: new Catholics to be baptized at Easter and lapsed Catholics to be readmitted to communion. These folks were praying and fasting during Lent to break the power of darkness and to prepare to cross the Jordan into the Promised Land. We ought to recover this ancient tradition and do penance for and with those who will enter or return to the Church at Easter. But there is something else that we should do. There are millions more who should be returning or entering. We need to tell them about Jesus. “Evangelize? That’s not my charism, not my personality.” “I need more education, first.” “I evangelize by example.” But the second Vatican Council and all Popes since teach that all Catholics are called to evangelize in both deed and word. True, not everyone is a Fulton Sheen, and not everyone can manage to get a degree in theology. But the story of the Samaritan woman (John 4) teaches the kind of evangelism that all of us can manage. First, Jesus models it for us. He comes to a town where everyone is a member of a heretical sect and sits down by a well. A woman comes to draw water. Israelites usually don’t talk to Samaritans, much less drink out of their vessels which were considered ritually impure. To boot, men usually don’t make conversation with women. 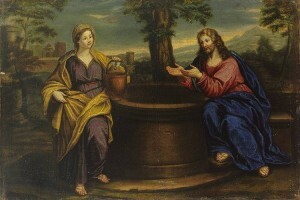 But Jesus recognizes her existence and affirms her by being willing to accept a drink from her. Once she gets over her shock, a dialogue ensues. It starts out about water, wells, Jews and Samaritans, but Jesus asks her questions that throw her off a bit and make her think. He finally asks a question that leads her to “fess up” and admit her need. She’s hungry for love, and has run through quite a few partners looking for the real thing. Jesus’ soul-piercing glance tells her that his is the love she’s been looking for. She abandons her water jar and returns to city to tell everyone about Jesus. Did she wait till she had a masters degree in theology? Did she sit down with people and demonstrate from Scripture why he was the Messiah? No. She simply told people, with joy, confidence, and conviction, what Jesus had done for her. And she invited people to come and experience him for themselves. And that’s how a large portion of that heretical town came to believe. And that’s how a large portion of the Roman Empire came to believe. There were no crusades in stadiums, no TV preachers. Christians simply listened to neighbors and co-workers with respect and love, asked questions to find out their needs, and told how Jesus had met similar needs in their lives. And then an invitation was issued to come check it out. One of our Lenten resolutions this year ought to be to get over our fear of sharing the good news, to be aware of the spiritual needs of those around us, and share His love. More people are looking than you think. “The fields are white for harvest” (John 4:35).